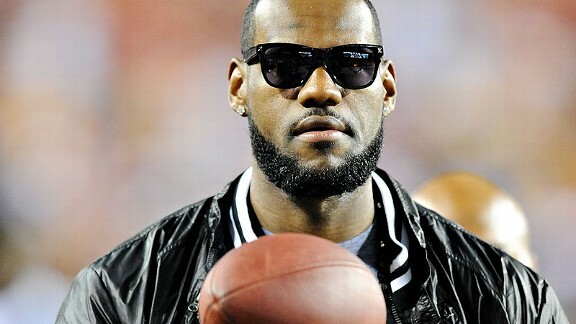 Is LeBron James really eyeing the NFL? LeBron James was an all-state wide receiver in high school. Is he considering a jump to the NFL? It was a quiet Tuesday afternoon in the NBA world. With news of 100 games being canceled, fans are taking long walks outside, kicking pebbles with their hands in their pockets, and wondering when all this bad news will end. Bubbles have been burst and hopes of the season starting on time have been extinguished by billionaires. Nothing worth getting excited about. That's LeBron James asking ESPN NFL reporter John Clayton about the deadline for free agents to sign with an NFL club. And Twitter promptly blew up in a speculative inferno. Obviously, LeBron is trying to stir up some fun by asking an innocent question -- innocent if it was asked by anyone other than LeBron. Of course, LeBron isn't your typical athlete. Standing at 6-foot-9, 250 pounds, he would be a protypical tight-end with freakish athleticism, speed, and hands. Because of the lockout, he's free to do what he wants with his career. David Stern is a powerful man, but he is powerless against this. We've seen cross-sport athletes before -- Michael Jordan, Danny Ainge, Bo Jackson and Deion Sanders to name a few -- so there's precedence for such a move. He played football in high school and was first-team all-state playing wide receiver as a sophomore. Our own Brian Windhorst, who went to the same high school as LeBron, informs us on Twitter that LeBron was an absolute terror to guard, especially on fades to the back of the endzone. LeBron was 6-foot-6 at the time when he played for St. Vincent-St. Mary's, going against 5-foot-10 cornerbacks. He recently suited up for his high school squad in practice and that sparked national headlines. "I've been around a lot of great receivers. I tell people that I rate my top receivers -- coaching, playing or watching -- as James Lofton, Jerry Rice, Steve Largent and LeBron James." Murphy went on to say that he swears LeBron could have gone straight to the NFL out of high school. Sure, this is probably just a bored athlete toying with a gullible audience. But, man, it's a spectacular way to ignite some water cooler chatter, isn't it? Would Cleveland Browns fans approve of his signing? For that matter, would the winless Miami Dolphins want him, knowing that it could potentially jeopardize both his Heat career and the Andrew Luck sweepstakes? Knowing that LeBron is a big fan of the Dallas Cowboys, how much would deep-pocketed owner Jerry Jones offer him to suit up for America's team? Clayton added some advice: "LeBron,, don't look at the Philadelphia Eagles. You're already on a Dream Team."